You really can’t miss that badge. The Porsche 911 Speedster is... you know what? I don’t know much about the Porsche 911 Speedster, at least not this one. I got this in a great big thread organizer full of cars at the flea market near where I used to live. And I got that one mostly because it had some really weird inclusions like a 1/64 NASCAR Racers #204 and some Busch Series cars. The wheels are somehow simultaneously extremely tacky and pretty neat. I never really was super big into Porsche as a kid. Not anything wrong with their styling - I had cars that absolutely were Porsche knockoffs - but I guess, like... the name wasn’t a priority when I grew up fixated on futuristic concept cars and high-powered straight-line American muscle. I’m trying to make up for it as time goes on, though! A very striking shape to it. Nearly everything I post here is either Hot Wheels or Lionel Racing / Action Collectibles. That’s not out of any lack of love for Maisto, Majorette, and Matchbox, just, like... I don’t have as many of them! So here’s a Maisto to shake things up. There’s some headlight damage - probably not the most road-legal, but when you’ve got touring cars and monster trucks on the same streets, you can probably get away with so minor an infraction. Luckily, the badging up front is quite nicely intact. It’s just about the only detail on the car besides the black accents. I will say, though, as I start to pare down my collection again, this one definitely seems like a keeper. A pretty excellent early-2000's aesthetic that seems perfect for a top-down cruise across the coast! 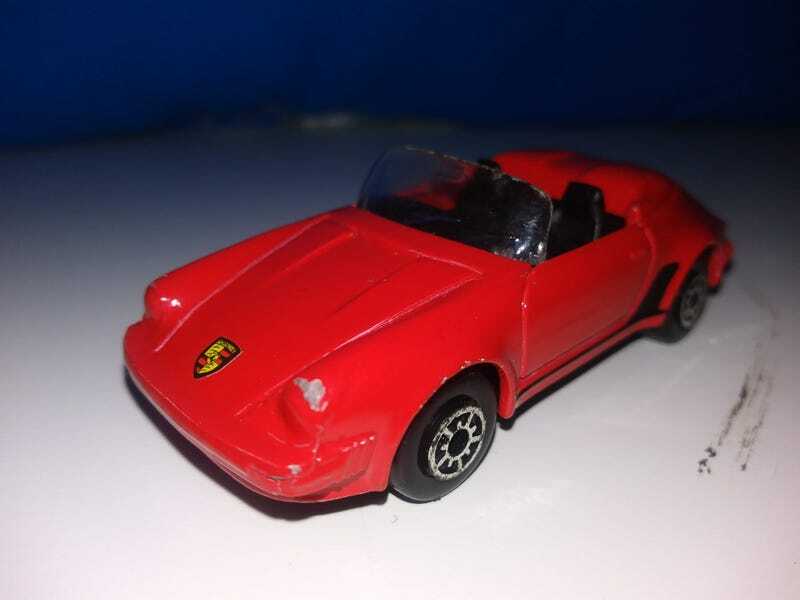 I’ll start digging into my own collection a bit and see what Porsches and non-Porsches I can find, but I figure this would be a pretty decent start!